Cricut headquarters is one of the most creative places on the planet, and at the very heart of it are some of our talented project designers. They’re constantly coming up with new ways to use their Cricut machines and collaborating on trendsetting projects. Meet three of our inspirational crew: Karley Hall, Desiree Moss and Meagan Patterson. After reading their answers, we’re sure you’ll agree that they have the best job ever. How did you get your start at Cricut and how long have you been with the company? Karley: I started working at Cricut in August 2016. While I haven’t been here long, the experience has been amazing. I heard about the position through one of my best friends, who was also applying. When I met a few of the team members during my interview, I realized that this wasn’t only going to be a job for me, but an extension of my family. Desiree: I graduated from Brigham Young University in 2013 with a degree in Costume Design, and I had no idea what was coming next. About three months after graduation, my friend told me about a project design job opening at Cricut. I was shocked that this type of job existed! I applied, had a couple of great interviews and have now worked here for over three years. Meagan: I’ve been here under a year and love everything about it! My dad actually works in the IT department, and it’s such a fun bonus that I get to work with him. I was originally hired as a Customer Service Representative, but a position for project designer opened up, so I jumped on it! The same day my Customer Care training was complete they offered me the position of project designer. Who knew? Karley: Crafting. All day. Everyday! This job is the epitome of my dream job. We get to play, design, and make beautiful things and get paid for it! Desiree: Working in a creative environment with incredibly talented people. They push me to try harder and take design risks. Meagan: I LOVE collaborating with each team member. It’s also super rewarding to see our fantastic Cricut users remake a project and love it just as much as I do! Karley: I love the simplicity of this project. I am a strong advocate of getting out of your comfort zone and traveling. 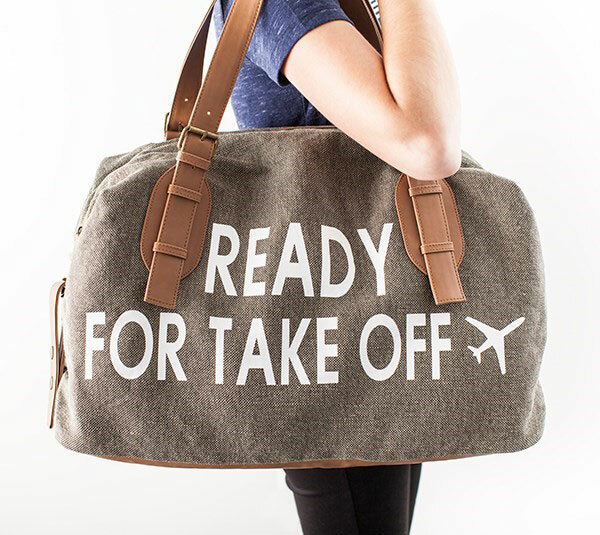 I feel like this bag is the perfect size for a weekend adventure, and it was so easy-peasy to make with the Cricut and some iron-on. Karley: I look at the details of life and find ideas in the shapes, patterns and colors of everyday items. Some of my spirit animals are Joanna Gaines and the brilliant ladies behind Shanty2Chic! Desiree: I find a lot of inspiration from online shopping… I know my mom will laugh at that answer! I love to see how my favorite stores market their brands, and it’s a great way to see what’s current. Meagan: Inspiration comes from life itself. It could be from walking through a store or looking through magazines--and for sure, Pinterest! But it also comes from leading a healthy lifestyle. I’m a firm believer in taking care of one’s self. How does the creative process at Cricut work? Karley: I have never worked at a more organized company! Cricut runs like a machine. We get fun requests from all over the company. Our team of project designers splits up the work and brainstorms together to make beautiful things that will hopefully inspire others to lead a more creative lifestyle. What is your favorite crafting trend at the moment? Karley: I am totally obsessed with the industrial farmhouse trend. My husband and I recently built a mudroom using industrial pipes and shiplap. Each time I walk by it, I smile. Desiree: Anything with wood or succulents. I love reclaimed wood art. I want to put these two trends everywhere in my house. Meagan: I love DIY home décor, especially farm style. 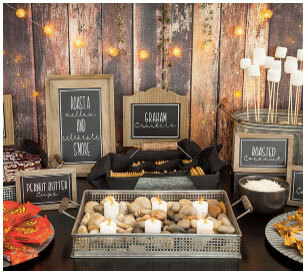 Anything that is rustic, antiqued and has beautiful natural elements is my jam! 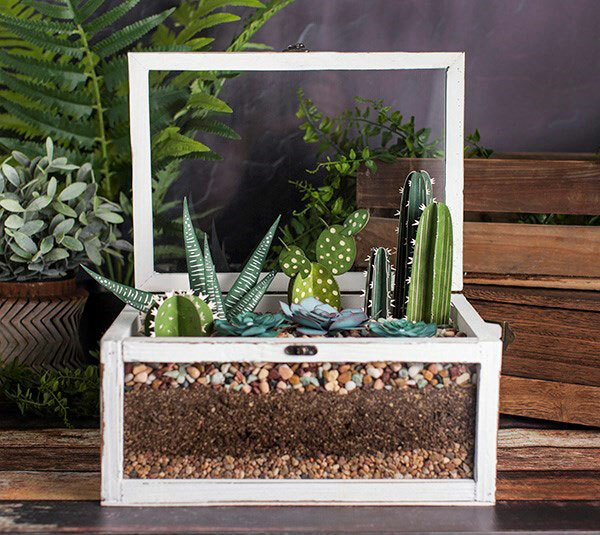 Desiree: This succulent project is my all-time favorite. It took me forever to ink the paper to look like succulents, but it turned out so real-looking. I can’t keep any plant alive, so I’m pretty excited to have this in my living room. What is your favorite aspect of the Cricut machine? Karley: Ease of use. When you cut a project with several different colors, the software automatically sorts out each shape by color and sets it up on your mat for you! Lifetime Cricut users may take this for granted, but other cutting machines don’t do this. Desiree: I love how professional it makes your projects look. Every time I give a Cricut-made gift, people never guess that I made it. Meagan: Other than all the cute colors it comes in? I love how intricately it can cut. Before using the Cricut machine, I cut a lot of things by hand. My carpal tunnel sure is grateful! Tell us about a project that didn’t work out as you planned. Karley: To be honest, most of my projects start in one direction and end a million miles away. In my head, I’ll think two patterns are perfect complements to one another, and then I layer them and hate the way it looks. It may sound frustrating, but it’s all part of the creative process. Desiree: This happens at least once a week. One time I made a darling paper wrap to go around a lamp. It looked incredible in photography. Later, the team was debating if it was a fire hazard. Turns out I had a 110 Watt bulb in a 50 Watt lamp. It was definitely a fire hazard. Meagan: It’s important to use each image in the most pleasing way possible. 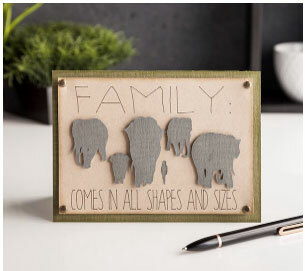 This card with Disney’s The Jungle Book on it was originally going to be a home décor piece, but everything I tried just didn’t highlight the beautiful simplicity of the image. So I scrapped that idea and went with a card. My Plan Q became my best plan ever! Karley: We’re constantly working on several projects. On average, our team finishes almost 30 projects a week! I just finished collaborating on a cartridge that will be released soon, and my projects on it include a beach bucket filled with summer essentials, a baby onesie and a home décor piece. Desiree: Most people would think I’m working on Easter projects. We work about three months ahead, so I’m working on Fourth of July projects instead. It gets a little weird when it’s snowing outside! Meagan: Recently I was asked to do some quilling projects, and those were such a fun challenge. The quilling tool we offer in the Paper Crafting Set really helped my designs come to life. Any advice for Cricut users? Karley: If you’re a new Cricut user, start small. Do a little research before you start. There are so many awesome video tutorials on our YouTube channel. For all the Cricut pros, try different combinations of materials and don’t be afraid to get creative! Desiree: Don’t ever feel like you can’t do it. It is always worth trying. Everyone has a little creativity in there. Let it show! Meagan: Never limit yourself with creativity. Constantly expand your horizons in every aspect of your life. What causes Cricut explore air to cut through vinyl and backing when machine is set on recommended setting? I accidently killed a cactus. What can I say? I’m not good with plants. I have monogramming stainless steel and acrylic/plastic tumblers with Cricut’s adhesive foil and vinyl. Some of the monograms have been pealing up. I am wondering if there are any suggestions for adding adhesive to the cut prior to placing it on the object without doing the whole Mod Podge process. I am at my wits end because I have ordered all these rolls of foil and vinyl and cases of Tumblers and I’m not sure I’ll be able to give a quality item to my clients. Help please. Pick the T-shirt template that corresponds to the type you are using, click on the text and add a letter Z. You can resize it to the size you need, then cut out on iron-on and apply. Have you tried removing the blade holder and blade and firstly check to see that is the right blade. If it is then re assemble the blade holder making sure the blade is properly seated and have another go. It is not any font is larger than another as you can enlarge them as large as you like. The only restriction is the size of your cutting mat. I am making a project with my granddaughter and she says we need a fabric pen. We are ironing on a sweatshirt. Will the regular circuit pens stay on when washed?